Time to decorate the front porch! We just gave the porch a fresh coat of paint, now I want to add some color, like plants but I don't have a green thumb and all my plants die or look terrible the whole summer. 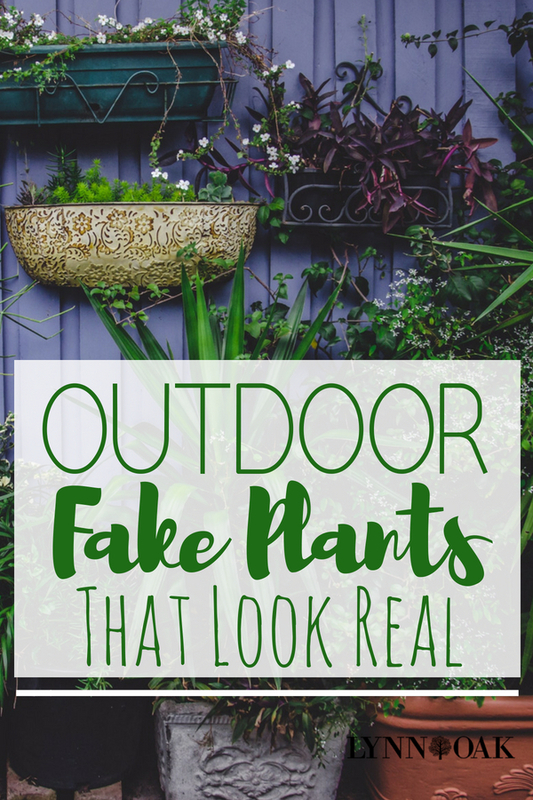 So my solution is to find some outdoor fake plants that look real! That way they will look awesome all summer long. Yey! I love the look of these on each side of the front door! Best thing about these is that you never have to worry about them dying or looking bad because you forgot to water them. Bonus! They look awesome! Most of the reviews from people say that it is a "Must Buy!" and "You Won't Be Disappointed". If you looking to decorate the outside of your home with plants, then this pair would be a great start to making your doorway looking more like a home. I also love that you can decorate these with each holiday! Just imagine that you can add Easter eggs at Easter, or fall leaves at Thanksgiving or some cobwebs at Halloween. The possibilities are endless and they will look Great for a very long time. No worries you home will look it's best all the time. I wish the grass didn't grow so much around here, then I would have it made! I'm in love with this silk beauty and would buy more than one to hang in between my columns on the front porch. I love the flowers on this one. The pictures of the people that bought them are amazing! One lady bought a metal basket with moss in it, which I think looks awesome, then she put the other two beside the front door in concrete plant holders. They totally look real! She said the same thing I did, spending so much money on live plants only to have them die the first month. She also read to place river rocks in them to give them weight so they don't blow out. Great idea! She also said they fit perfectly in 10" pots. She said they lasted the whole summer and she will put them away for summers to come. Awesome! Just what I wanted! With these I'll never have to worry about watering them, and my porch will look great all summer! Let's look at the next one I picked. I love these! I can keep real ones alive for a while but they do end up looking terrible before the end of the summer. I love the red flowered ones the best. I really like the look of adding these to a chain planter that has moss in the bottom. It really makes them look more real to me. Everyone really likes how vibrant the colors are too! Don't you love the look of Boston Ferns hanging on the front porch? I know I do, but I think I've only bought them once since living in our country home of 20 plus years. They are so expensive! And with my black thumb, they look terrible after the first few weeks. They start turning brown and then die off little by little. Well this one will save you so much money and heartache. Just think it will never look brown and dead. Your home will look great all season, then put them away, wash them off and put them back out next year. Your investment will last for years to come. And your friends will think you are some kind of Garden Ninja because they look great all year long! Let's fool them! I'm game if you are! Do you have a Tropical Theme going on in you home and need some greenery to finish it off? This big guy will look awesome by you front door or even on your back deck! My neighbor built a deck and then added about a dozen of these on theirs. He might have went a little overboard but he's a little weird anyway. :-) And we live in Indiana so we don't have anything like these growing in our area. Most of the reviews are outstanding, one person said she bought a few of these for her tiki bar she has out on her back deck. See! Lots of people are doing this, you can even put them in a sunroom to create a more outdoorsy look. I hope some of these gave you some ideas on how to decorate your outdoors without all the hassle of having to take care of them each day. Saving you time to do the things you love to do! Good Luck on your outside decor!